learn more about the Defold engine (sponsors of the global event) from the very people who make it. Some food and drink will be provided (courtesy of Defold), and whilst there will be a demonstration or two, this is primarily a community-driven, mingling event. The event takes place from 18:00 on Thursday the 14th of January, 2016 at King’s office (Sveavägen 44, Stockholm), in easy reach of T-Centralen and Hötorget metro stations. Registration for the event is relatively informal, however we’d appreciate it those who are able to would register on Facebook, so that we have some idea of attendee numbers. If you haven’t done so already, we also recommend you join our Facebook group to keep up to date with announcements like this one! 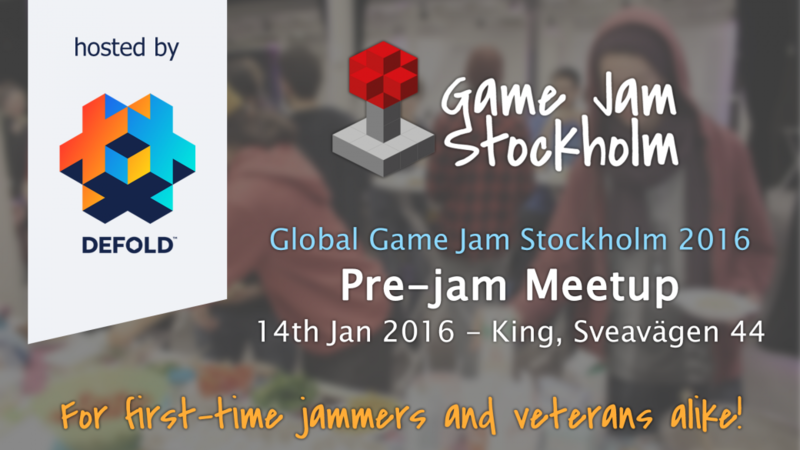 This meetup is intended for those attending Global Game Jam Stockholm 2016 – an annual event in which we join other, similar jams around the globe as part of Global Game Jam. You can read more about our main event and register for tickets right here. Find out more about King’s free, 2D game creation tool at Defold.com.